On this episode, Landmark Home and Land company president Steve Tuma reviews the company’s philosophies and methods of helping customers, and why Landmark Home and Land Company’s reputation matters. Interviewer: Hey everyone and welcome to another episode of the Panelized Prefab Kit Home Building Show. With me as always is the President and Founder of Landmark Home and Land Company, a company which has been helping people build their new homes where they want, exactly how they want across the nation and worldwide since 1993 and that man is Steve Tuma. Steve, how are you doing? Steve Landmark: Excellent. It’s a nice day today and I guess we’re going to be talking about panelized homes more. Interviewer: Yeah. I thought we would break from our usual mode today and talking about prefab home building design planning, et cetera, and get into something I think future home builders will find interesting and useful and that’s Landmark Home and Land Company’s history, the main mission of the company and sort of your overall goals and objectives that you’ve put forth since your inception – what now? Twenty-five years ago? Steve Landmark: Twenty-five years, right. 1993 we started this and just grew and grew and became a nationwide and international company. Interviewer: Good. So to start with, let’s talk about Landmark Home and Land Company’s main mission. Can you run through the company, sort of basic all-around mission plan for us? Steve Landmark: Basically the idea is we want to be available with the right knowledge to help a customer design and build their own home. People may understand the general concepts of hey, I want a nice floor plan but they might not know how to develop the floor plan or the plans for permits or the plans to assemble the home or finish the home. Then also how to actually build it. With the processes we have with our panelized home system, we provide the key elements, the hardest components of designing and building a home, so that it’s easy for them. So the bottom line is help them design and build a house that makes sense for them where they can control the building process and understand what they’re building in the specific home, but also make sure works in their budget and then their goals for the end results of the house that they want. Interviewer: Now, there are things you provide like assistance and good design, easy permitting and a great panelized home structure for the new home. Tell us a little bit about what you think your goals are and what you hope to achieve with each customer when it comes to just putting together a great panelized home kit. Steve Landmark: Well, basically it starts – a lot of people know – have a general idea of what they want. They know they want a two-story home or a ranch home, about 1500 square feet or whatever the size is. They may know that they want a two-car garage. They typically know hey, I want to build it in this town or in this area and go from there. But sometimes that’s the beginning step. But how do they get to the end? So how do you take that idea of hey, I want a three-bedroom home, build it for this price and this community? How do we kind of target those things? And that’s where we supply the knowledge and the bridge in a sense to get them from the concept to the actual set of plans, permitting, then building the house, so it’s a house that they can move into. So we’ve been doing it for 25 years and that the knowledge and kind of help that we provide helps fill in the gaps that customers need. Some people are very advanced and they know what to do. They’ve already built a house, two or ten. Others, it’s an idea and they want to get it going. So we’re able to help them get those ideas together and the design concept. You know, making sure it’s a good design, making sure it fits the land, making sure it’s energy-efficient. You know, all those details come into it. Make sure it looks good. Make sure it ties into the community and then also the permitting. Make sure that your building department will accept the plans. You can’t just walk in with some hand sketches on a piece of paper in most building departments and say, “Hey, this is what I want to build. Just let me go.” There are some that will allow that but most of them, they’ve got to have pretty sophisticated plans to make it clear what needs to be built, so that they can inspect it properly to make sure that it fits the code. So we’ve done this for so long that we have the knowledge to help people long. So like I mentioned, some people need more help. Some people need less help. But we’re there as kind of a reference point, a support system, a knowledge base to help people do it and we do that through open, clean, easy communication. We’re available to help people build a home. I should also bring up the panelized home because that makes it easier. The quality of labor that’s generally available isn’t as good as it was a long time ago. There are weather conditions. Some areas, you’ve got a shorter building season and also with our panelized system, you as the owner/builder can retain control of the project and an understanding of what’s going on there. So you know one of the biggest elements of cost in the panelized system, but you also know the specifics and by working with us on a panelized system, we also developed a set of plans that allows you to understand and control your project, so that you know what needs to be built. You can understand the budget and then keep on path to make sure that it gets built properly. So it’s a – I guess it’s kind of a long answer to say we take care of the customers and help them along. Interviewer: Well, Landmark is – you guys have built a reputation for great customer service. I mean it’s just well-known. But how does a company like yours achieve that sort of reputation? Is it a passion for what you do? Is it a dedication to common courtesy? Let’s talk a bit about the history of Landmark, how you got started and what those years were like. Steve Landmark: Well, the thing that you bring up, taking care of customers, how does it happen? Yes, it’s definitely a passion. When it’s a passion, it’s all fun. You enjoy it. You like going the extra mile to take care of people and yeah, let me review the Landmark Home and Land Company processes of what we do to take care of people. We communicate with them. We answer the phone. We provide answers that are clear and understandable and if someone needs a little extra time, we will take that extra time to review the process with them. So yes, it’s basic common courtesies, which sounds weird but it’s missing in today’s world and any place that provides a service. So we go the extra time to make sure and I work specifically and individually with each customer to make sure the house is done right, all taken care of properly and they end up with a very high quality home. So I think the customer service thing is a result of passion and our dedication. We’re the owners of the company. We started it. In a sense, it’s our baby as such. So we just like to go that extra mile to make sure that people are taken care of properly. That allows us to develop a very strong reputation. We like to stand up to it and exceed it and go that extra mile. If people need help, we are always available to help them through the process. If they run into a situation where they need help or they just need help to make sure that the home is designed properly, the home is assembled properly, that’s the key element. It’s the communication and not just one-on-one with the customer but also in the clear set of plans because Steve, the plans are communication. You draw a plan. You say, “Hey, this house is type of siding. The rooms are this big.” That’s what contractors know. They’re going to be able to develop how much drywall they need or what electrical materials they need or what heating materials they need by a clear and accurate set of plans. So that’s the key element in what we provide. It’s not just the kind of trusted knowledge base and availability so that we could communicate with people. But it’s also in the product of the actual set of plans that are accurate and then those plans matching the panelized home package. So it just makes it easier. I think we wrapped that up into a one-stop shop. So if you need something, give us a call. We will help you through the process. Interviewer: Now in 1993, I mean the whole world was different when you guys started. Interviewer: The internet wasn’t there. Nobody had cell phones. I imagine you guys have seen a lot of changes in your company and the way that you reach out to people and how you get your company’s concept and the concept of panelized home building across. Steve Landmark: Well, the basic fundamental issue of take care of the customers and help them along is the same. But with the advent of the internet, cell phones, availability, the technologies that are there, it has changed it and it has made it easier. Some people call us. Some people email. Some text us. Some do all of them. In some cases, we mail them plans. But most people now can receive PDFs. They have the technologies there to look at things on smartphones. There are more computers. There’s generally broadband internet access all over the country. So we’re able to take care of it. But the fundamental point of take care of the customer was there in 1993 just as it is there today. It’s just a different method and communication. A lot of people think, “Hey, do we need to meet? Do we need to do this?” Well, you can call us at your convenience and get you taken care of instead of setting an appointment further out. We’re available all the time and I think that’s a key element. People, you know, they need help when they need help. If they have a question, saying, “Hey, I’m thinking about a kitchen cabinet. What about this?” or “Hey, I’m going to talk to my heating guy tomorrow. What about this piece of information?” The availability to be able to send an email, a text or a call and say, “Hey, how do I get this answer?” is very important and Steve, not everyone understands it. A lot of people think, “Hey, this is simple. Let me do this. There are little complexities where people will have questions and we’re able to take care of it.” A lot of people say, “Well, doesn’t everyone help?” No. We can help with the design, the understanding of the building processes, the permitting, the delivery of the panelized home package, the assembly plans. So there’s a lot of details of what we supply. It’s not just hey, here’s a pile of wood. Put your house together and good luck. It’s to say, “Here we are. We’ve planned it, so it’s easier for you to build the house. It’s easier for you to get permits. It’s easier to go through and achieve your end result of getting the home that you want.” That’s dedication, passion and just enjoying our business. Interviewer: I think that you hit on something there people underestimate. Just the fact that if you – when I’m trying to get customer service, just to get somebody on the phone is great or to write an email and not have a robot email return saying, “We will get back to you in 48 hours.” That study is annoying and I think just the ability of having somebody available to pick up the phone or at least to get back to you on a timely manner means a lot to people nowadays. That’s one of the elements that we really try to point out to people is hey, by planning it out upfront, all on paper, you will keep your budget better. Your financing will be better. Your scheduling will be better and to tell you the truth, the headaches will be down considerably. I think that’s what makes it a very enjoyable process. Interviewer: Now you’re talking about – you had mentioned three words, “one-stop shop” and it sounds to me like that one stop includes basically supporting the project. It means supporting the builder throughout the project, not just leaving them hanging after they’ve bought the product, so to speak. So I imagine you think that’s – customers appreciate that much about working with Landmark Home and Land Company. But what do you personally think are the strongest assets that you provide your customers when – you know, with what they’re looking for and how you’re able to step up to the plate? Steve Landmark: Well, I think the key to it is the dedication to our customers’ projects. We enjoy – even though we’ve been doing it for 25 years, it’s extremely enjoyable to see a family get a home and that’s whether it’s a basic, simple home or a big mansion or whatever it is. It’s pretty cool because you actually change people’s lives, their ability to live different ways, to sleep better, enjoy times with family, work from home, enjoy hobbies. You know, those types of situations. A properly built home will really help that. So I think the dedication and understanding and the passion for the customer’s need to get a home is one of our main situations. Now secondary to that but equally as important is just communication. We stay in touch with people. We’re available. We’re proactive to helping on with your project. We’re knowledgeable. We’ve been doing things for 25 years all over the country. We understand situations that people may end up in. We understand the pitfalls and we’re knowledgeable in helping people through and yes, even if the problem is – or I shouldn’t say it’s a problem. The question that someone brings up doesn’t directly involve our product. Like hey, what should I do with different kitchen cabinets? Well, we’re involved in designing the kitchen but we’re not involved in the kitchen cabinet. There are still a lot of things we can help them through with the process to put them in the right step, to sort those items out. Now amazingly, our customer base are people that have researched what’s going on. They understand what’s happening. They know what they’re getting into. Every once in a while, we got someone that has never done it. But they have the mindset and understanding and aptitude to do so. But every – no matter how many homes you’ve done, there’s always something different. Maybe it’s a different state. Maybe it’s a different piece of land. There are always little details that it’s nice to have someone to talk to, to develop the process and the plan, so that it’s easier for someone to plan the home out and – I don’t want to make this sound like it’s hard. It is a lot of work. But the point is if you plan it through, and develop a plan for building, it’s much more enjoyable. The quality of the home will be better. Your schedule will be better and your budget will be a better situation. So it’s taking the time to think it through and that’s what we like to do is make sure that we’ve got a quality product going on, a quality project with a good customer that is intent in building the home properly. That I think is the main point. It’s just – and also the continued support through the project. We just enjoy it and it’s also a situation where hey, if our customer is happy, hopefully they tell a friend and the friend buys from us next year. That’s a huge portion of our business with people buying in the end or telling a friend. You know, whether it’s the next day during the process or a couple of years later. It’s pretty interesting. It’s pretty interesting to see how people enjoy it. So the main advantage is not necessarily just a set of plans in the panelized project. But it’s the care for the customer and making sure that they have the proper support to build the best house possible. It’s just caring. So that sounds interesting but it’s that simple. It’s caring. Interviewer: Well, that’s kind of what I wanted to get to today is just the fact that – you know, we’ve talked a lot about the actual technical aspects of building a prefab home. But today, I think we’ve got a much clearer idea of exactly what Landmark is all about and the way you approach your unique business plan. So anyway, once again, we’ve come to the end of another great show. But before we head out, Steve tell our listeners the best way to get more information and how to contact Landmark Home and Land Company. Steve Landmark: Well, the quickest and easiest way, you could do it right now. It’s look at our website. It’s www.lhlc.com. It’s basically the initials of Landmark Home and Land Company, so www.lhlc.com. You will see our website. There’s a variety of plans. There are different discussions on kit homes, panelized homes, engineering situations like that, what we supply in our package. You can also call 800-830-9788 or you could send an email. Mike can work with you. It’s mike@lhlc.com or you can email me directly at landmark@lhlc.com. Like we talked about, the key to it is taking care of the customer. We will try to answer the phone right away. But you can also – we will be extremely responsive to emails with complete, thorough answers, so that you’re able to see the service that we can provide that really will become the support system to the best home you can build. Interviewer: Awesome. 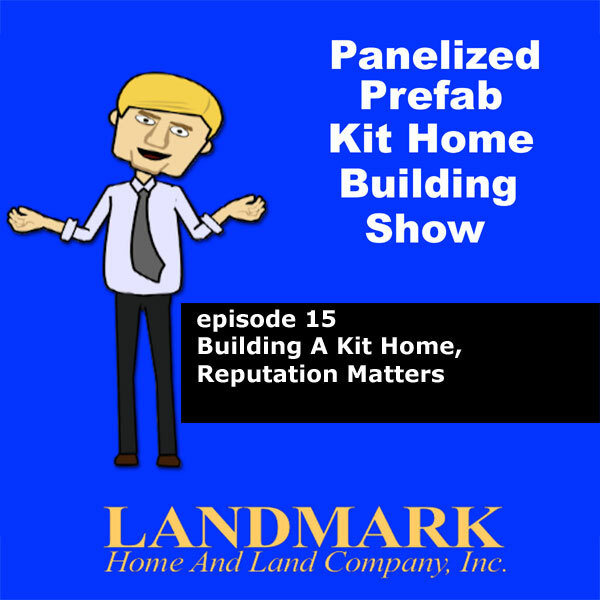 Well, we are about wrapped with this episode of the Panelized Prefab Kit Home Building Show. So for Landmark Home and Land Company President Steve Tuma and myself, thanks for listening and we will see you next time.